President Obama issued an Executive Order on Friday establishing a new task force that will work to make U.S. communities more resilient to change-related impacts, such as heavy precipitation events, more frequent coastal flooding, and more severe and longer lasting heat waves. The Executive Order enshrines the climate change buzzword of the post-Hurricane Sandy era — “resilience” — into the language of the federal bureaucracy by directing agencies to work with state, local, and tribal leaders to determine how they can make it easier for communities to prepare for climate change-related impacts. 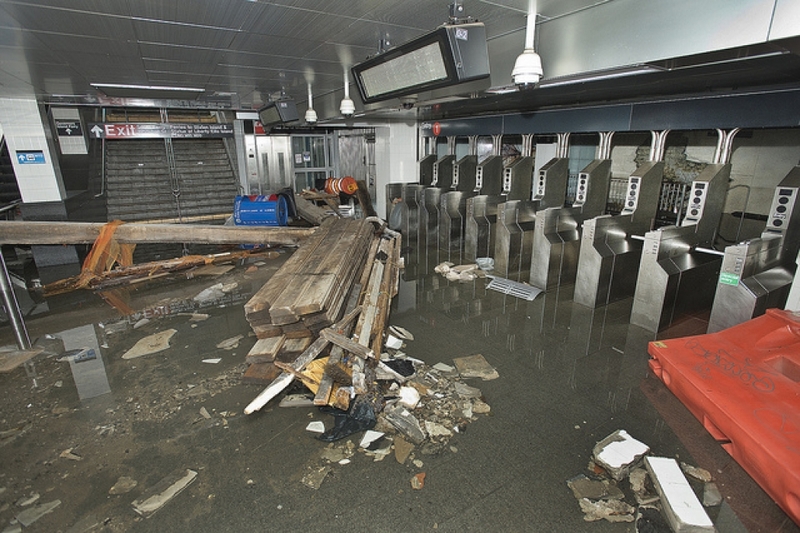 Damage at the South Ferry subway stop in New York City following Hurricane Sandy on Oct. 30, 2012.
Credit: Flickr/Metropolitan Transportation Authority / Patrick Cashin. The “Task Force on Climate Preparedness and Resilience” will identify barriers to making resilient investments, such as a need to modify federal grant programs to provide incentives for construction projects that take climate change-related sea level rise into account, rather than encouraging communities to rebuild damaged property to outdated construction standards. The task force will also make recommendations on what information resources they need to make more informed decisions related to climate change. A common complaint from decision makers at various levels of government is that climate change risk management tools are in their infancy, and data is scattered about the government at sites that can be difficult to navigate, such as NOAA’s National Climatic Data Center, the U.S. Global Change Research Program, and NASA. The Executive Order also directs federal agencies to develop an open data portal within the data.gov domain, where leaders can access policy-relevant climate science information. Stymied by congressional resistance to climate regulations, the White House has increasingly turned to executive actions to implement its climate policies, including Executive Orders. Such orders do not need congressional approval, but they can also be rescinded by subsequent presidents. The task force already has 7 state governors on board — all of whom are Democrats — as well as the governor of Guam. Those officials include Vermont Governor Peter Shumlin, whose state was severely damaged by flooding during Tropical Storm Irene in 2011. Local officials on the task force include Mayor Eric Garcetti of Los Angeles, Mayor Bob Dixson of Greensburg, Kan., whose town was nearly wiped off the map by an EF-5 tornado in 2007, and Dawn Zimmer of Hoboken, N.J., whose city was severely flooded by Hurricane Sandy. Hurricane Sandy alone caused at least $65 billion in damage, and hard-hit states such as New York and New Jersey are working with federal agencies to determine whether and how to rebuild some vulnerable coastal communities, particularly in light of the escalating risk of coastal flooding due to sea level rise. The Executive Order goes beyond previous steps by directing federal agencies to “develop and implement strategies to evaluate and address their most significant climate change-related risks.” Under the Obama administration, agencies had already developed their first-ever climate change adaptation plans. 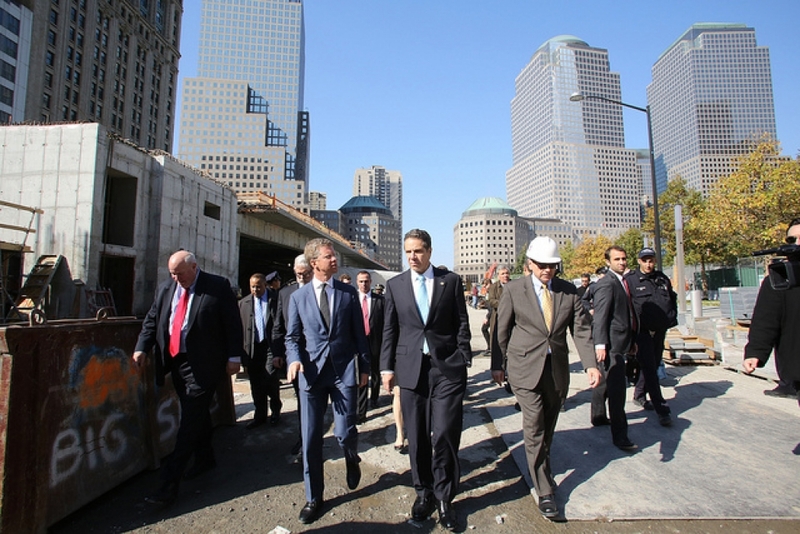 New York Governor Andrew Cuomo (center) walks with HUD Secretary Shaun Donovan (left) on a post-Hurricane Sandy resilience tour in Lower Manhattan on Oct. 29, 2013. To oversee the climate resilience activities of federal agencies, the White House is also creating an Interagency Council on Climate Preparedness and Resilience, co-chaired by the Council on Environmental Quality, the Office of Science and Technology Policy, and the assistant to the president for homeland security and counterterrorism. The Executive Order follows on the heels of the Obama administration’s rollout of its Climate Action Plan in June, and greenhouse gas emissions limits on new coal-fired power plants, which were put forward in September. Environmental groups, including the Natural Resources Defense Council and the Sierra Club, praised the White House’s announcement. “We strongly support reforming federal programs to reduce vulnerabilities to climate impacts and embedding climate risks across all governmental decision-making,” said Mindy Lubber, president of Ceres, a nonprofit organization mobilizing business leadership on climate change. “In the past three years, federal taxpayers spent $6 on disaster cleanup for every $1 spent on community resilience,” said Daniel J. Weiss, senior fellow and the director of climate strategy at the Center for American Progress, a liberal think tank in Washington. Weiss also called on the new task force to identify a “reliable” stream of federal funds to go toward community resilience, rather than the current system of funding, which is dominated by post-disaster response bills.